You might see this image and recognize the fish as Lipogramma evides, but in actuality, this is the newly-described Lipogramma levinsoni. Image from Curaçao Sea Aquarium, photo by D. Ross Robertson. We can thank the ongoing diving and collection of Curaçao’s Curasub for expanding the genus Lipogramma by two species today. Authors Carole C. Baldwin, D. Ross Robertson, Ai Nonaka, and Luke Tornabene published their findings in the article Two new deep-reef basslets (Teleostei, Grammatidae, Lipogramma), with comments on the eco-evolutionary relationships of the genus, in the December 7th, 2016, issue of ZooKeys. These new species join a small but expanding group of deepwater fishes found in the tropical western Atlantic Ocean. 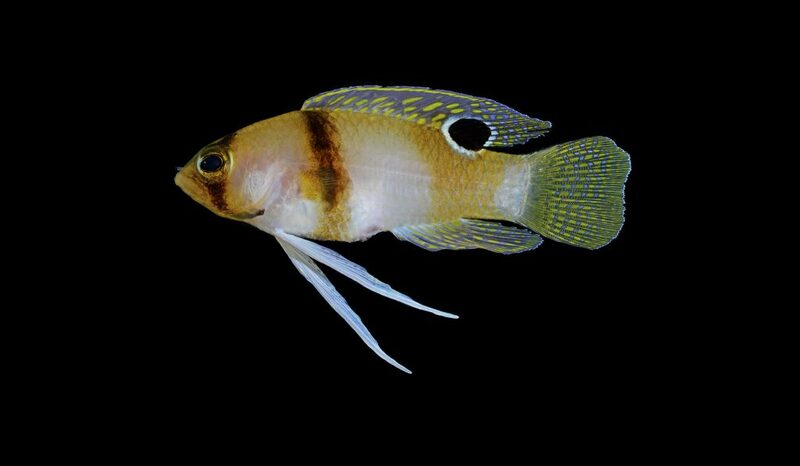 The first new species is Lipogramma levinsoni, dubbed the Hourglass Basslet due to the shape of the bands. This fish was long presumed to simply be a juvenile form of the already well-known (but very rare in the aquarium hobby) Banded Basslet, Liprograma evides. Visually, L. levinsoni differs from L. evides by having wider, heavier bands that completely encircle the body. When compared side-by-side, the difference is rather easily seen. Compare the Lipogramma levinsoni holotype at left, with Lipogramma evides, shown at right. It is easy to see the difference in band width and shape between these two species. Both photos by D. R. Robertson and C. C. Baldwin. Findings from the paper and prior research suggest that L. evides is likely a deeper water species than L. levinsoni. What does that mean for rare-fish enthusiasts? It is possible that some (or all) of the fish entering the aquarium trade may in fact belong to this more shallow water species, L. levinsoni. Based on the visual information presented by the authors, it certainly seems that all the fish that show up in trade literature as L. evides may in fact be examples of L. levinsoni. So, in fact, it seems more likely that we should call L. levensoni the “already well-known” species in the trade. The other new species, Lipogramma haberi, is more distinct. 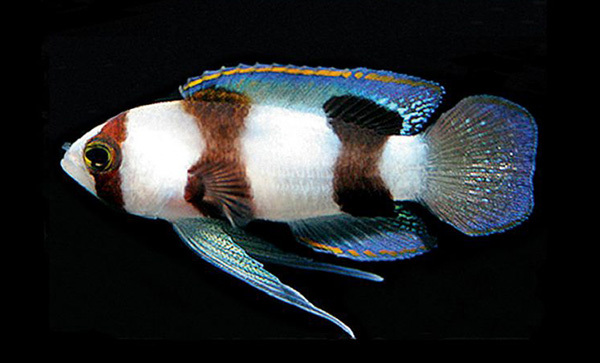 The authors proposed the common name Yellow Banded Basslet. Currently known only from Curaçao, at depths of 152–233 meters, the authors speculate that this species could have a much broader range, but have simply been hidden by the lack of exploration at these depths. Emphasizing the point that the world’s deep reefs are vastly under-studied, the authors conclude their paper by noting that Lipogramma robinsi, shown in the video below from Blue Harbor, is due to get a couple new sibling species described as well. We encourage you to read the full description of Lipogramma levinsoni & L. haberi online at ZooKeys.